Many, many light years away, far in to the future there exists the Galaxy of Zylatron, peopled by races from distant parts of the universe. 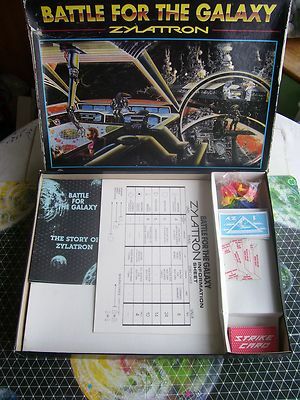 When the Zulls first arrived in Zylatron the galaxy was uninhabited except for the planet Opton. They settled on Zull because it has an atmosphere similar to Earth. The first Zulls to arrive remembered the disastrous wars that had almost destroyed Earth and they were determined that in their new home there would be no more wars. Unfortunately it was many aeons before this was to be. First there was the hundred aeons war with the Optons, then the invasion of the Zarbs ending with the Great battle of Zylon, which finally left the Zulls supreme. It was then that the leaders of all the planets met and agreed to the system that exists today. Battle Planners fight their battles on the board using symbols representing armament of the planets. This game is over 26 years old!